Hi everyone! How are you all doing? I am so excited because I’ve started to sit down with each of Fragments’ designers and asked them my favorite list of questions; we have so much to share with you in the coming weeks. Today, I went to tell you all about one of our newest fashion jewelry designers – LK Designs. Designer Leetal Kalmanson, from Israel, creates fun, flirty, bold and glamorous jewelry. There are earrings galore in a selection of metals and crystals you could simply die for. 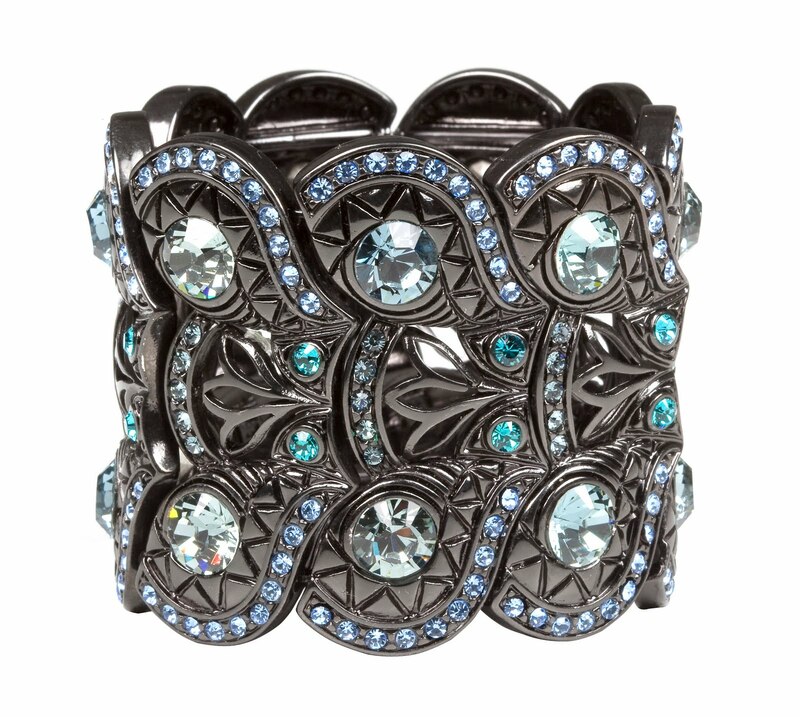 Stretchy cuffs with intricate design and bursts of color. This is a collection that lends itself to major accumulation – we want everything. Leetal is extremely talented, passionate and lives each day to the fullest. She represents her jewelry in a most graceful way, and gives her all to continue to grow and evolve her brand. I loved having the opportunity to ask her these questions; I hope you’ll fine her answers as fun and endearing as I do. 1. What is your greatest indulgence? 2. Tell me your biggest fear. To be featured in a fashion magazine as the worst dressed woman! 3. Your favorite red carpet moment of all time? My personal red carpet moment of all time was presenting on stage at the end of the LK – HP fashion show, while being 8 months pregnant. LK Designs together with Hewlett-Packard (HP), the world’s largest computer company, designed the HP – LK jeweled mini laptop series. These HP-LK jeweled laptops were launched in the first LK and HP Fashion Show which was a big hit and included front-row celebrities such as supermodel Bar Refaeli. 4. Your most treasured piece of jewelry, and why? It is the first piece of jewelry I ever designed, which was a stretch bracelet with a special star and crystals. I asked my husband what he thought about it and he was not very excited. My husband was wrong as I sold hundreds of such bracelets in a couple of weeks and this was the beginning of LK Designs ! 5. White gold, yellow gold or mix it all up? My favorite jewelry designer is Van Cleef & Arpels since their jewelry pieces are timeless ! 10. Who do you most admire, alive or deceased? I admire most princess Diana, since she became a real “princess” through her personality, and not through her official role. 12. Newspapers & magazines: print or online? I think that for fashion, print is it ! The best quality to view jewelry and fashion is still in print magazines. 13. Your favorite ice cream flavor? Facebook ! I vote like my kids! 16. If you could design a piece of jewelry right now, based on your current mood and surroundings, what would it be? 19. Tell me your greatest asset and your biggest flaw. My greatest asset is my thrive for perfection. This is also my biggest flaw. 20. If you could have any piece from Fragments, what would it be? Have a fabulous day everyone! I will be back soon.